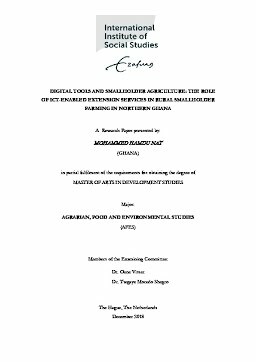 This study was conducted on ICTs and smallholder farming, assessed the accessibility, extent of use, challenges as well as potential effects of information communication technologies (ICTs) on smallholder agriculture in northern Ghana. This assessment was done considering the age, gender, farm size and literacy levels of smallholder farmers. Based on a survey and some additional interviews, the study found that among the various types of ICT services provided in the ADVANCE II project, the price information and market in-formation options were the least used by farmers. It also found that access to, and use of mobile phone was very high among farmers in the project. On the extent of usage or application of the information delivered to them via mobile phones, nearly half (48%) of farmers indicated that they always apply the information in their farming process with males dominating in this category. Young people were the dominant in the use of the ICTs within the study area as about three-quarters (74%) of respondents were within the age category of 20-39 years. Also in the category of farmers with larger farm size 4 acres or above, it was found to be predominantly males. In terms of the challenges that confront farmers in the use of the ICT services, the prominent ones include: difficulty in using phones; loss of in-formation when call is missed; system do not allowing for interaction or feedback; low literacy levels of farmers; shorter forecast period (48 hours) as well as information delivered as call rather than a voice SMS. These challenges can be categorized in to two main ones, namely: low capacity /skills of farmers and weaknesses in the ICT system or package as an intervention.